In 1938 Wittgenstein delivered a short course of lectures on aesthetics to a small group of students at Cambridge. The present volume has been compiled from notes taken down at the time by three of the students: Rush Rhees, Yorick Smythies, and James Taylor. They have been supplemented by notes of conversations on Freud (to whom reference was made in the course on aesthetics) between Wittgenstein and Rush Rhees, and by notes of some lectures on religious belief. 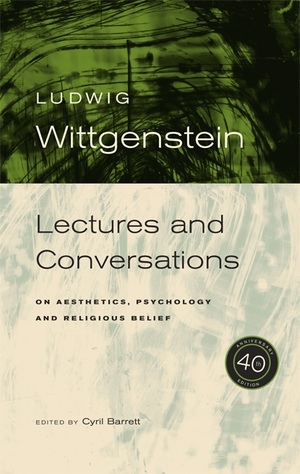 As very little is known of Wittgenstein's views on these subjects from his published works, these notes should be of considerable interest to students of contemporary philosophy. Further, their fresh and informal style should recommend Wittgenstein to those who find his Tractatus and Philosophical Investigations a little formidable.